The Mt. Judah Loop Trail on Donner Summit is the area's most popular trail. It's a 4.35 mile loop that begins at the Pacific Crest Trailhead, goes up to the top of Mt. Judah and then back down. The views at the top are spectacular and the second half of the hike is downhill. People go for the exercise, the scenery and maybe to watch raptors sail on the air currents at eye level when they're at the top. There is another reason to go though. Donner Summit is the most important historical square mile in California. On the trip up and down Mt. Judah there are a lot of stories but most people don't know about them. This set of web pages will partially remedy that. As you travel the trail look for the signs like the one above or for the sponsors of different trail sections. Look also for turn offs (see below) . Links to the hike brochure with QR codes (PDF 8.5x14" in size) - page one and page two. Dutch Flat Donner Lake Wagon Rd. Coldstream Pass and Donner Pk. To get to the trailhead take Donner Pass Rd., Old Highway 40, to Sugar Bowl Rd. opposite Donner Ski Ranch. Take the first left on to Old Donner Pass Rd. and go to the parking area. The trailhead is up 100 yards or so where the road makes a sharp bend. There is a map there. On the hike there are two trail turn offs from the Pacific Crest Trail before you arrive at Roller Pass (there's a sign there). Either turn off takes you to the top of Judah and then back down. 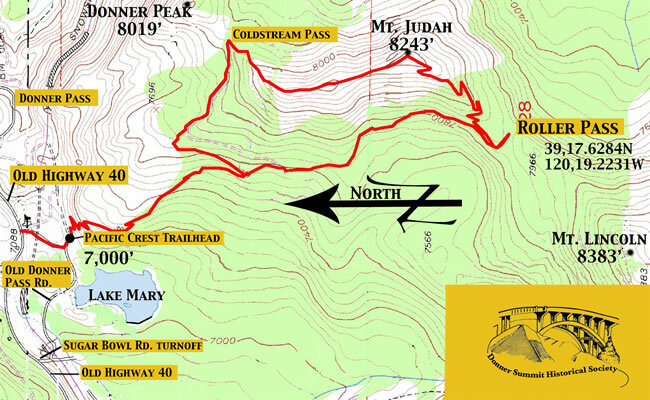 The Mt Judah Loop Trail is mostly part of Pacific Crest Trail. The Pacific Crest Trail is a congressionally designated National Scenic Trail that runs 2,650 miles from Mexico to Canada. The trail runs along the spine of the Sierra Nevada range and passes right through Donner Summit. The nonprofit Pacific Crest Trail Association partners with the U.S. Forest Service and hundreds of volunteers to maintain and protect the entire 2,650-mile Pacific Crest Trail. For more information, go to their website and learn how to get involved.